Saffron is the most regal of spices, It is Saffron, that gives the Spanish dish Paella or the French Bouillabaise their pronounced yellow, almost gold colouring. The name screams extravagance and luxury. But what is it and why is it literally worth its weight in gold? Saffron is the dried stigma of the purple crocus flower (crocus sativus). Stigmas are the part of the flower that catches the pollen and there are only three per flower. All have to be handpicked and on the same day the flowers appear (they pop up overnight). These are then dried to intensify the flavour. 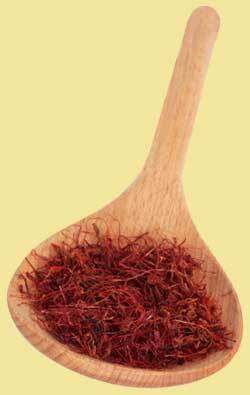 During the drying process saffron loses 80% of its volume. The recommended shelf life after production is three years. That’s why it is so expensive . . . but a little will go a long, long way. The flower came originally from west Asia, the name stems from the Arabic word for yellow - za’faran. According to legend the plant was created when the Greek God Hermes fatally wounded his friend Crocos, Hermes then changed the blood into the purple flower. The ancient people of Greece, Rome andMesopotamia valued it highly, not only for its culinary uses, but also as a clothes dye and as an aphrodisiac. The Romans thought it also delayed intoxication. The Egyptians used it as part of a prized remedy called kuphi where it was mixed with honey and other aromatics. The Buddhists and Hare Krishna followers used it to colour their robes as the colour signifies wisdom, enlightenment and illumination. When you look for it on the supermarket shelves you may find it in both thread and powder form. The Swiss-based International Standard Organisation (ISO), which sets standards for many different products sold on the world market including spices, requires a minimum of 190 degrees of colouring strength to be present in any saffron to be sold as Category I, the highest quality available. In practical kitchen terms, you want to be using the best quality saffron available so that your cost per use remains low and the resulting dish has all the possible saffron aroma and flavour, as well as colour. The better the saffron, the less you use per recipe. What most people think of when they hear the word saffron is a brilliant, egg yolk yellow colour. What very few people realise, however, is that saffron's colouring strength is tied directly to its aroma and flavour potential. The higher the colouring strength, the more intense the flavour and aroma. So even if you don't give a hoot about saffron's ability to colour your rice, bread, etc its distinctive yellow hue, you surely care about the flavour and aroma it imparts to both. Saffron's aroma enveloping a kitchen is really appealing. When I am working hard at recipe development, I consider saffron's aroma enveloping my kitchen a great reward for my efforts. I have used Greek saffron which has a colouring strength of around 250, varying just a few points with each new harvest but always way above the minimum International Standard. This would simply not be possible if too much extraneous material was being mixed in with the saffron stigmas. My best advice is to be concerned about saffron's colouring strength rather than country of origin or the company supplying it. Look for the ISO rating on the package and by pass anything without it. Store your saffron airtight and away from light so it stays potent for a long time and you don't waste any. My recommendation is to use powdered saffron if you can get it, except of course when you really want to see the threads in a dish. The powder can be measured easily, disperses colour very evenly, can be added directly to recipes without extraction, and costs the same as threads but is more potent and therefore stretches further. When using saffron threads, one must plan ahead and steep them in something hot, something acidic or something alcoholic, whichever liquid is in your recipe. This is known as extraction, steeping or making a saffron tea. This should be done for a minimum of twenty minutes. This ensures full extraction of the aroma, flavour and colour in your dish. Steeping is not necessary when using saffron powder. To toast or not to toast? The habit of toasting saffron threads (whiche enabkes you to crush them and to extract more flavour and colour from them) is a dangerous practice. It is too easy to burn the delicate, expensive saffron threads. The other safer method of extraction mentioned above is easier, safer and equally effective. When working with saffron threads, avoid using a whisk or wooden utensils, which will either trap the threads or absorb the saffron’s colour and flavour. If you are uncertain about how much saffron to use, be cautious and then gradually add more the next time around. Once you have put too much saffron in a dish there is no way to correct the error and its flavour can be very overpowering. And if you are uncertain about which other flavours to combine with saffron, begin with thyme, tomatoes, ginger, lemon and garlic (sparingly) or some combination of this group since these are particularly compatible. If you want to learn about saffron's true strength, begin by making a saffron ice or hot tea just using hot water, saffron threads, lemon and the sweetener of your choice. I pondered, tossed and turned when writing this week’s column about the recipe to use as an example of a recipe using saffron. There are so many wonderful recipes that can use the unique saffron colour and flavour. But I thought something very simple and basic was the only way to go. Those of you new to this spice will then be able to appreciate its uniqueness, its flavour and all its other properties. So it is a fresh saffron custard this week, or as professional chefs prefer to call it, Crème Anglaise (English cream). Why not just make an easy packet custard? You could, but why would you want to spend that money on saffron and throw it into a packet mix that will be no doubt harsh in vanilla flavour? From this recipe you can then spring board into so many other dishes, ideas for which I have also included. Enjoy your Creme Anglaise and bon appetit . . . . .